The Quest” is a replacement dwelling in Swanage, UK. Planning permission was granted earlier this year, and it is due for completion Jan 2016. The site is heavily wooded and enjoys a beautiful southerly aspect with a view over the Durlston Country Park. Early on, we established the advantages of a single-storey building; it would suit the retired clients’ future needs, give an elegant solution to the steeply sloped site and allow a simple arrangement of spaces. 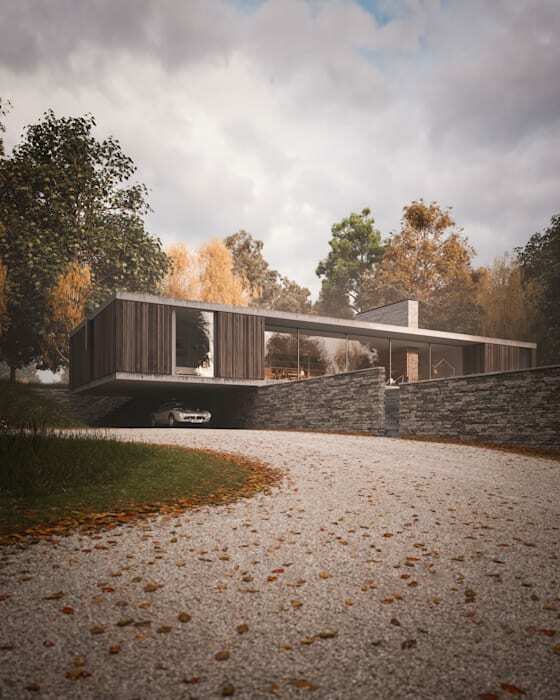 At the same time, the design reduces the visual impact from across the valley when looking back towards the house and helped the scheme from a planning point of view. The sloping site—with protected mature trees—very much dictated the positioning of the dwelling. Access is via the front of the property, so we made use of a retaining wall, faced in local Purbeck stone, to define different levels and visually mask the vehicular route, maintaining a clear view from the living spaces across the valley.